When choosing a motor oil for your bike, it is very important to understand the temperature ranges that you use it in. Colder weather conditions require a multi grade oil with a fairly low "cold" viscosity. If you are strictly drag racing on very hot days, you would use a fairly thick "mono-grade" oil. Your bike's owners manual has some rough guidelines, from there you need to experiment. I live just north of San Francisco where the coldest temperature that I will ever start my bike in is around 50F on a day that could get up to 93F. This fact is very important and guides the choices in terms of viscosity. The oil should not contain graphite or molybdenum additives or API SH or higher oils displaying a circular API "energy conserving" service label on the container. Do not use non-detergent, vegetable or castor based racing oils. Many oils are of a grade and type defined by the API service classification (see chart). If this wasn't at all confusing enough, now we have ILSAC GF-3 vs. ILSAC GF-4. The International Lubricant Standardization and Approval Committy establishes motor oil standards that car manufacturers jointly agree on for the specification of oils to go in their engines. The recent establishment of the GF-4 standard has been particularly hard on the performance minded driver as the oil has to now meet strict economy, cleanlieness, performance and emmissions standards. See the specs on GF-3 (here) and GF-4 (here). Some good pictures of why this is important are seen here. Most high performance oils choose to forgo the GF-4 designation due to the economy and emmisions specifications, but they may otherwise be a superior oil. Group I. Mineral oils refined using the historical techniques (i.e., solvent extraction of aromatics, solvent dewaxing, hydrofining to reduce sulfur content). This processing produces mineral oils with sulfur levels typically greater than 0.1% with viscosity index (VI) of approximately 90. Group II. Mildly hydrocracked mineral oils with conventional solvent extraction of aromatics, solvent dewaxing, and more severe hydrofining to reduce sulfur levels to less than 0.1% (typically 0.3%), as well as removing double bonds from some compounds. Viscosity index is approximately 90-100. There is now an informal Group II+ (not an official API definition) which emerged out of the need to describe base oils with a meaningfully higher viscosity index than the 100 than is typical of most Group II base oils. 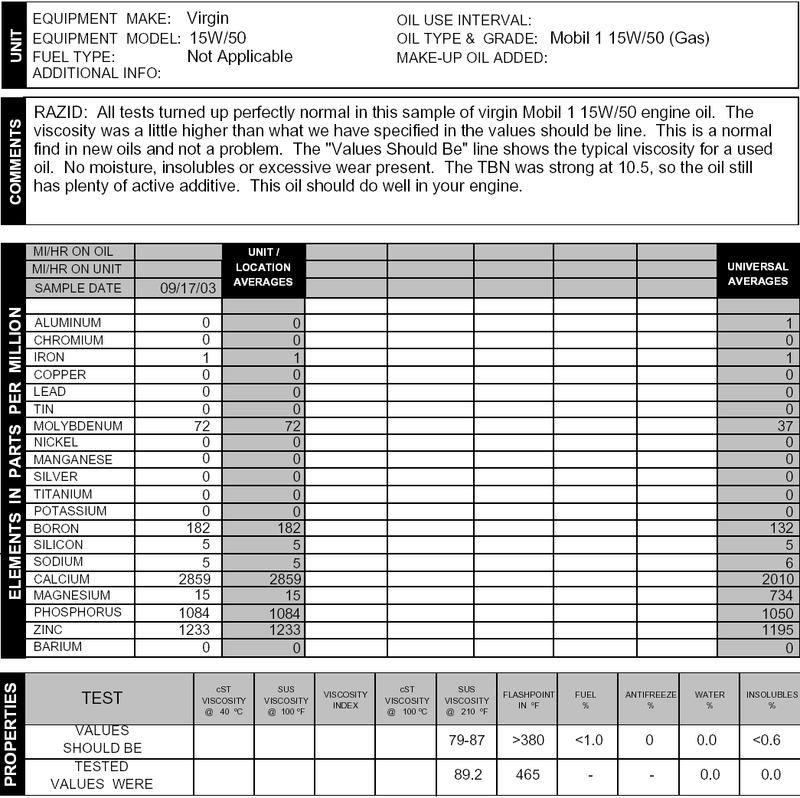 Group II+ base oils typically have VI in the range of 108 to 115. These base oils offer performance advantages over Group II in some passenger car motor oil applications, specifically related to balancing volatility with low temperature viscometrics. Group III. Severely hydrotreated mineral oils with sulfur content between 0.001 and 0.01%; VI in excess of 120. These are considered VHVI (very high viscosity index) mineral base stocks. They behave like synthetics in VI but have much higher pour points (-20C versus -54C for PAO) which must be modified with pour point depressants for lower temperature use. They have lower oxidation stability than Group IV or V oils. These are made in proprietary processes by Shell, Exxon, and others. New Gas-to-Liquid base stock lubricating oils are being developed for market introduction in 2005 that will compete with Group III and PAO at costs similar to Group I. These will enter the passenger car motor oil market in response to demands for more 0W oils. They are created using catalysis of natural gas and have properties similar to PAO. Group IV. Poly-alpha-olefin (PAO) synthetic oils with VI of 125-150. PAO significantly outperforms Group III in low temperature applications without the need for pour point depressant additives. Group V. Esters, polyethers, polyalkylene-glycol (PAG) synthetic oils with various VI ranging between 100 and 175. Esters are hygroscopic, causing water to enter the oil; and reactive, adding natural detergency, seal swell, and additive solubility to oil characteristics. From what I understand, High Temperature / High Shear Viscosity (HTHS, ASTM D4683) is the real measure of the strength of your oil. The higher the number, the better the protection. Usually, a higher viscosity oil will have a higher HTHS number. It is important to remember that maximizing engine protection can be done at the expense of maximising power. It is best to run the least viscous oil that provideds adiquate protection for your riding style. See ScootR's Graph HERE. I was running Mobil 1 With SuperSyn 15W-50 (Red Cap). This is a high performance full synthetic motor oil that actually costs less than the stock Pro-Honda GN-4 10W-40 (by Apollo America, MSDS) (mineral) and is widely available at most auto parts stores. I cannot say enough good things about running this oil. Compared to the stock oil, my bike runs smoother, shifts better, and feels far more solid when my RPMs are above 10,000. Because Mobil 1 15W-50 lacks the "energy conserving" additives that the rest of the Mobil 1 line has, it is fine for motorcycle use. Do not use any other grade of this oil as it may affect clutch performance. Mobil 1 With SuperSyn is truely one of the highest quality synthetic motor oils that you can use for everyday performance riding. It made of Poly-Alpha-Olefin (PAO) synthetic base oils (with some Ester oils), very nice, high cost base stock oils. For more info on Mobil 1, read THIS. Retail cost - $5 per quart. Recently, Mobil revamped their entire line of oils, and redcap was dropped. It was replaced by Mobil 1 Extended Performance 15W-50 and they added Mobil 1 Extended Performance 10W-40 (filling a gap left in the old product line). They did change the formula slightly, but this oil should work as well, if not better than, the old redcap. Running Red Line 10W-40 Synthetic Motor Oil is another excellent option. It can be ordered direct or purchased at a local distributer. It is priced slightly more expensive than the Mobil 1 15W-50, but it comes in 8 different viscosity grades and even though it has a very high Moly content, it should not harm your clutch. The Mobil 1 15W-50 can be a little thick giving the engine a very solid feel, but if you are really trying to squeeze more horsepower out of your modern engine, the thinner oil may be better. My bike is slightly more vibey running the Red Line, but it does feel snappier. I would love to compare dyno runs to find out if it is really making more power. The Red Line oil has a very high viscosity index. It is made using a large percentage of PE Polyol Ester synthetic base oils (in addition to PAO basestocks). These oils are very good at extended very high temperatures. When it comes to extremely hot, high pressure racing situations, the high ester content oils really start to shine. If you are running turbo or supercharged system, and/or nitrous, Red Line should be your first pick. Specific Info on Red Line motor oils is HERE. Retail cost - $7-8 per quart. Mobil 1 does offer a special "motorcycle" oil. MX4T 10W-40 is just a little thinner than the 15W-50, and quite a bit more expensive. It is probably better in terms of performance to run the thinner oil, but a more solid feeling is gained by the thicker stuff. It's your choice. If I had a really tight tolerance street engine, or had to start my bike in very cold weather, I would consider the MX4T. Retail cost - $9 per quart. One more option in the Mobil 1 family is the Truck & SUV Formula (Yellow Cap). This is a 5W-40 oil that does not have any EC labeling. It is compatable with gas and deisel engines, so it should be compatable with motorcycles. An interesting option on a 40 weight synthetic oil. Silkolene is really nice stuff and used by top race teams from around the world. They make another high Ester based synthetic oil. Specifically the Silkolene Pro S 5W-40 Engine Oil. This is usually a special order from the local shop. Among all of the good reasons to run a synthetic oil is that they do not require polymetric thickening additives to produce a multi-grade behavior. These thickeners tend to crack under heat and sheer, producing unstable viscosities over time and use. Simply put, a synthetic oil lasts longer. If you are interested in some good reading on a test of synthetic oils, follow THIS link to the Paradise Garage. Riders of bikes that use wet clutches (almost all but some Ducati and Harley) must be cautious with some of the new API defined "Energy Conserving" motor oils. Some specific additives in these oils can cause the clutch's on some bikes to slip under heavy load. Molybdenum Disulphide is considered the main culprit for clutch slippage (although other friction modifiers, phosphorus and zinc, or poor clutch condition/design may truely be the culpret). While this should all be of concern when using a non-motorcycle specific motor oil, the Mobil 1 has been used for years by motorcyclists with no problems. Motorcycle Consumer News did a test on standard and motorcycle motor oils HERE. After reading this artical, you may never buy a motorcycle oil again. Trevor White really goes into the motorcycle specific oil question. Mark Lawrence has an extensive look at oils on his website, important to note is his statements regarding the use of synthetic oils during break-in periods.Mike Guillory has written an excellent article on this topic, Also Ed Hackett provides some good data and some information on viscosities. 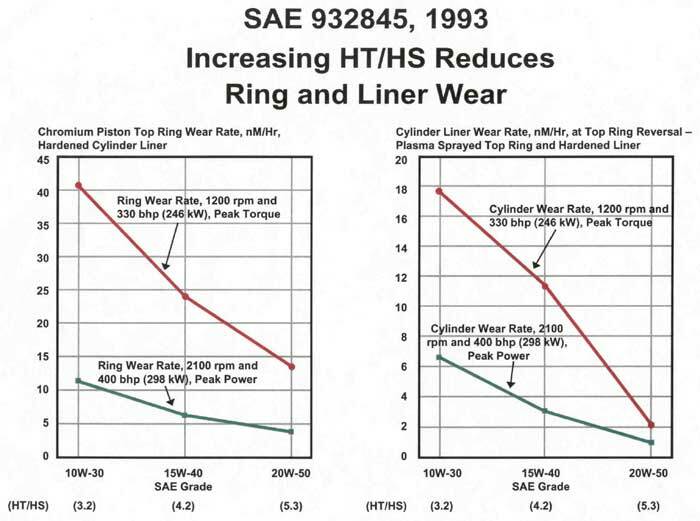 Don Stevens' artical Making Sense of Synthetic Lubricants is very good. The engine oil that you drain from your bike when doing an oil change is very valuable. Think of it like the fortune teller thinks of tea leaves. By ordering a VOA (virgin oil analysis) and a UOA (used oil analysis), you will be given a very precise picture of what is happening inside your motor with regard to lubrication or mainanance issues. HERE is a VOA of Mobil 1 15W-50. The major player in oil analysis for the consumer is Blackstone Labs. For about $20 you can get information about your engine and oil that you have only dreamed. If you are interested in some good reading on UOA, follow THIS link to the Paradise Garage. One of the best sources for information on oil, greases, and filters online is the Bob is The Oil Guy Forum. Many different opinions and facts are presented, but it is the best place to work out the fine details.